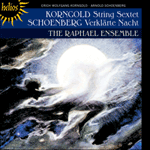 Verklärte Nacht is a rare experiment in the field of the ‘chamber symphonic poem’. Doubtless influenced conceptually by Smetana’s quartets, this one-movement tour-de-force of intensely chromatic post-Tristanesque harmony, with its quasi-symphonic textures, created a furore when it first appeared. The public was shocked by the (then) modern harmony—especially an inverted chord of the ninth ‘which does not exist’. Schoenberg remarked tartly, ‘and thus cannot be performed, as one cannot perform that which does not exist’. All of this is conveyed by the music in a sustained outpouring of rich, polyphonal, densely scored string-writing, maintaining an unremitting tension. The work falls into five sections which roughly correspond to the five stanzas of the poem. The slow introduction in D minor sets the mood as in the first stanza of the poem. The ‘moonlight’ theme, a descending chromatic figure, is reminiscent of the opening of Liszt’s B minor Sonata which in its one-movement form may have provided Schoenberg with a blueprint for this work. After only twenty bars the harmony takes on a decidedly Wagnerian character—note the ambiguous chordal progressions which recall the opening of the famous Tristan Prelude. An agitated and extremely tense accelerando leads to the woman’s speech (bar 29) ‘I carry in my womb a child, but he’s not yours …’, heard in the first viola. The music is dominated by a mood of guilt and self reproach, centred firmly in minor keys. At bar 50 the music changes, to prepare for the sudden introduction of a new, ardent theme in E major at bar 100 (‘now I have met you, ah you’). The third section of the music is a spectral, grotesque scherzo (bar 124, ‘She stumbles on’), and graphically depicts the uncertainty of the woman as she wonders how her companion will respond to her confession. To reflect this sense of ‘walking blindly’, the harmony becomes even more ambiguous, almost tenuous, while the metre swings to 9/8 with the marking ‘Drängend etwas unruhiger’ (‘Hurrying on somewhat restlessly’). This marvellous, almost symphonic passage leads to the fourth section which introduces the male character. His first words—after the intensity which has gone before—are dramatically stated in a radiant D major (bar 230, ‘Let the child you have conceived be no burden on your soul’). Schoenberg’s wonderful colouristic writing to reflect the lines ‘You are floating with me on a cold sea, yet between our two hearts there flickers some special warmth, from you to me, from me to you, that will bear that child to me, by me’ (bars 251–265) brings a glittering, transcendant quality to the music which alters the entire mood. The modulation to the rarely used, highly chromatic and brilliant key of F sharp major at this point ‘uplifts’ exactly, as in the manner of the poem. The final section (bar 370), in the tonic major, presents the ‘moonlight’ theme, now ‘transfigured’ and accompanied by a colouristic,. bass, ever more yearning (bar 391, ‘Their breaths were joined in the air as they kissed’) and the delicate final coda is exquisite, as the earlier ethereal arpeggiatura (from the fourth section) is reprised. The work ends molto pianissimo, in D major. Although scored deliberately for string sextet, the music palpably cries out for greater forces. Schoenberg recognized this and later re-scored it for string orchestra in 1917 (revising it in 1941); it is by this version which the work is best known. The thematic material described above is sparse, economic, and used in the manner of the Wagnerian Leitmotif. The one-movement form is tightly constructed and there is no sense of waste or excess. ‘In music there is no form without logic, there is no logic without unity’, Schoenberg once observed, and it is nowhere more apparent than here. In his liking for the one-movement form (he exploited it particularly well in his monodrama Erwartung from 1909, which has certain plot similarities with Verklärte Nacht) Schoenberg unwittingly shared a compositional trait with Korngold, who also showed preference for condensing his ideas into a single unbroken movement: as well as a symphonic poem Sursum Corda, a Cello Concerto, the symphonic poem Morgen and the late Theme and Variations, Korngold composed a one-movement Piano Concerto for the left hand (for Paul Wittgenstein in 1923) which manages to encompass an astonishing range of mood and expression in a tautly constructed scenario that has been described (by pianist Gary Graffman) as a ‘keyboard Salome’. Innovative use of form and harmony then, was a striking characteristic of both of these remarkable composers throughout their careers, in spite of their differing views on how each should be used. Verklärte Nacht owes much to the tone poems of Richard Strauss in the way it is developed, although a conventional analysis can be applied. Some scholars believe it to be set in a massive double sonata form, with the third section acting as a bridge between the two. I suspect that Schoenberg’s motivic scheme and thematic development is much more subtle than that, and is probably unconsciously done. In other words the entire work was composed without a preconceived plan and, like all great works, obeys an inner logic which conforms to a variety of analyses. One of the most remarkable aspects of early Schoenberg is his mastery of harmony after such rudimentary training. It is known that his instruction under Zemlinsky was short-lived and that he was largely self taught. The earlier D major Quartet (written under Zemlinsky’s guidance in 1897) was a sort of ‘trial run’ for Verklärte Nacht, and would seem to have provided him with enough knowledge of instrumentation to attempt this large-scale and innovative work (although he had played cello in the Fröhliches Quintet in the early 1890s with Fritz Kreisler, and he also started an earlier Sextet ‘Toter Winkel’, a fragment of which still exists, running to 31 bars). He admitted, in his Harmonielehre (first published in 1911) that when he wrote whole-tone passages (in Verklärte Nacht and later in Pelleas und Melisande) he was unacquainted with the use of the scale by Liszt, the Russians, or Debussy, or that he was even aware that he was doing it. By 1900, the finest examples in the String Sextet repertoire were by Brahms, and here in Verklärte Nacht we find Brahmsian elements too. The angular melodic leaps and the delicate frisson of the coda seem to suggest late Brahms. Did Schoenberg therefore unconsciously attempt to reconcile the famous conflict between Brahms and Wagner in this work? Schoenberg was unable to attend the first public performance of Verklärte Nacht. He was in Berlin where, to support his wife and daughter, the struggling young composer was working at the Buntes Theater, as musical director of the Überbrettl, a kind of cabaret, which influenced his early cabaret-style songs and ultimately Pierrot Lunaire. Two figures walk through the bare, cold grove. The moon glides with them, they look into her face. The moon glides over high oak trees. into which the black branches reach. Ich habe mich schwer an mir vergangen. I carry a child, but he is not yours. and so I am now with child. now I have met you—ah, you. She looks up, the moon glides on. Her dark face is drowned in light. von Dir in mich von mir in Dich. be no burden on your soul. Just see how all the Universe glistens. that will bear that child to me, by me. You kindled that flame in me. You have turned even me into a child. Zwei Menschen gehn durch höhe, helle Nacht. He caught her around her strong hips. Their breath kisses in the air. Two figures walk through the high, bright night.